If you’re an aviation junkie like us, chances are you’ve heard about Qatar Airways new QSuite. It’s revolutionized and challenged traditional business class seats, and has been named World’s Best Business Class by Skytrax. 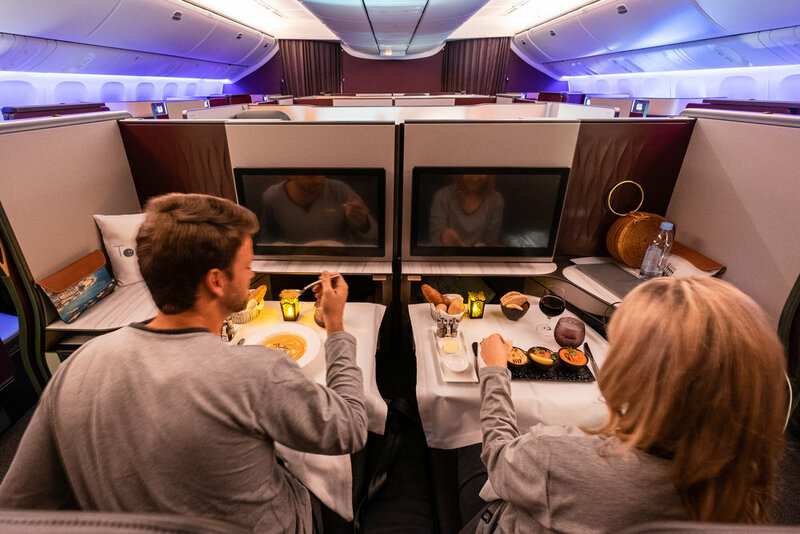 Well, folks, Qatar Airlines has just brought the QSuite to LAX - and we had the honor of going on their inaugural flight from Los Angeles to Doha! That’s right - little ol’ US! We’re still not sure how we even qualified for such an incredible and momentous occasion, but that’s besides the point. Our trip was amazing. The QSuite is amazing. It’s hummus, tabbouleh, and moutabel served with freshly toasted Arabic bread - and it’s absolutely heavenly. We were blown away by how fresh it is, and how flavorful each dip was. It was some of the smoothest, creamiest hummus we’ve ever had. Who knew oatmeal could be this delicious? We like to joke that you can judge a place based on the quality of their oatmeal, and if that’s the case, Qatar Airways gets five stars. It’s hearty and delicious and has the perfect amount of “sweet”. The main courses that we were served in the QSuite would easily rival a popular restaurant in LA, both in presentation and taste! The Seared Halibut was one of our favorites, served with steamed pumpkins, saffron veloute, and roasted kipflers. The fish was cooked perfectly (how do they even DO that on a plane?! ), and the flavors all paired wonderfully together. A quick flip through the extensive wine and beverage menu, and we quickly realized we were in for a treat. From the welcome glass of sparkling “Atair” Brut Rose, to “Spier” an oaky and zesty South African Chardonnay, to Bobby’s favorite, the Old Fashioned (with Woodford Whiskey and Angostura bitters), everything Qatar Airways serves is premium. To most people, a 16 hour flight sounds a lot like hell. And we’ve been there. There’s nothing worse than being stuck in a cramped space for a significant amount of time. All you want to do is lay down, stretch out, snuggle up with a comfy pillow, and SLEEP. On the QSuite you can do just that, and it makes all the difference in the world. Not only do the seats lay completely flat, but if you’re traveling with your significant other, they turn into a double bed. We’re serious. It’s amazing. Not only that, you can close the doors on either sides of your seat for total privacy. Turn on the “DND” (Do Not Disturb) button, grab your eye mask and earplugs, and you’ve got the dream airplane situation - literally! Cozy pajamas from The White Company, 21.5-inch entertainment monitors (with almost limitless entertainment options), and BRIC amenity kits stocked with Castello Monte Vibiano skincare products… the amenities in the QSuite are top notch. Even the restrooms are glitzy and clean - and surprisingly spacious! We can’t say enough about the Qatar Airways staff. From the warm greeting when we checked in, to calling us by name in-flight (and even giving us recommendations and advice on our stay in Qatar), they truly went above and beyond in every way. We felt special. We felt valued. We felt like family. It’s not often you can say that about an airline. There’s a reason why Qatar Airways continues to lead the way as one of the best airlines in the business, and we get it now. They understand their customers, and they aim to please. 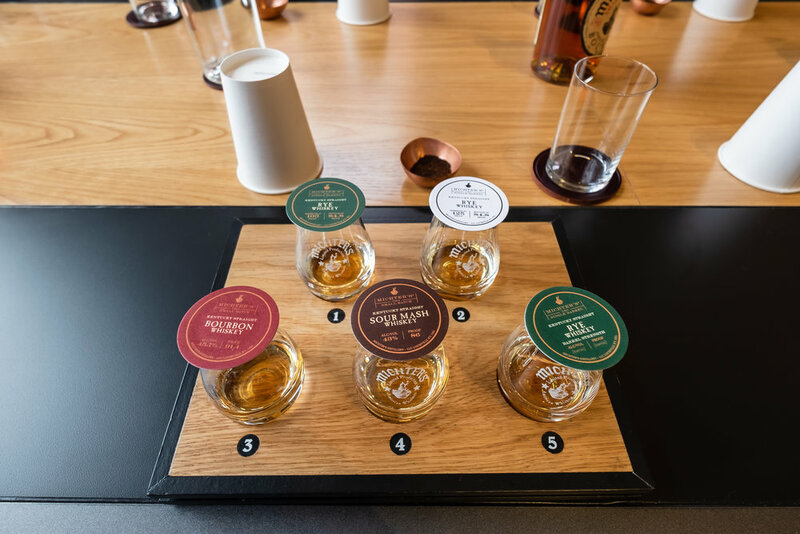 We saw this firsthand in the QSuite, and we can’t wait to see how they continue to innovate and perfect their in-flight experiences. They’re killing it already! If you want to fly in the QSuite, but are hesitant due to the price, there are ways to cut the cost. It’s not a destination you hear about often, unless you’re a frequent international traveler. The Hamad International Airport (DOH) is one of the best in the world (currently ranked #5), and it handles more than 30 million travelers every year. That’s a lot of people! Chances are you’ve passed through the airport once or twice during your travels, but have you ever thought about extending your stay? 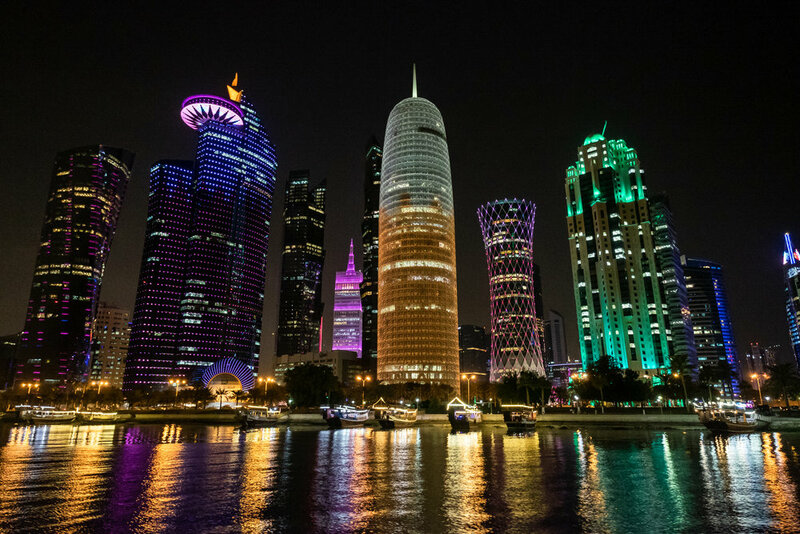 After having spent the past few days exploring Doha, we HIGHLY suggest you do. From five star hotels, opulent shopping malls, man-made islands, and a bustling foodie scene, this country is growing rapidly - and it’s truly a sight to see! Here’s what you should see, do, and eat in Doha, if you have only 48 hours to explore! We could write a blog just about the vast array of shopping in Doha, Qatar. 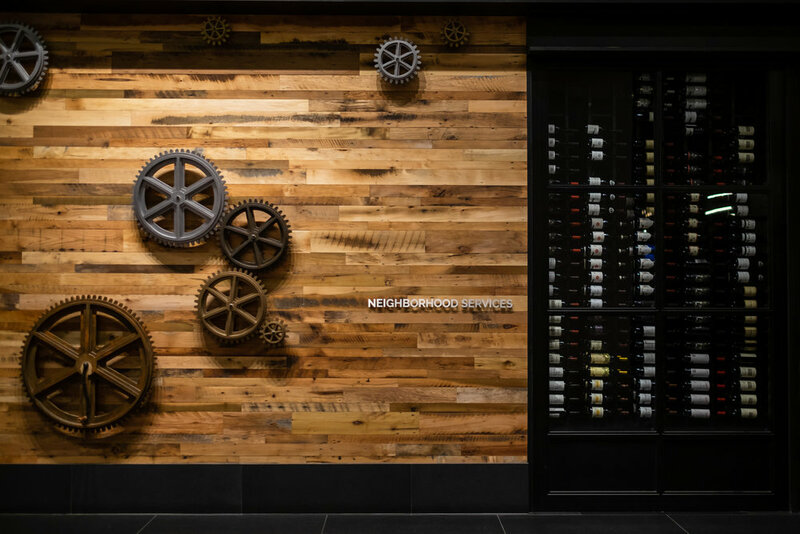 From extravagant and glitzy malls like The Villaggio (think the Forum shops in Las Vegas, times ten), to hip boutiques and local designers, this wealthy capital has it all. Our favorite place to shop (and dine) however, is the iconic Souq Waqif. The Souq Waqif is an open-air street market, and it’s old world Arabia at its finest. Adventure through the maze of narrow alleys and lively squares, where you’ll find everything from Beduin weavings, to handicrafts, jewelry, bronze figurines, spices, birds, bunnies, and more! Try “Karak” from a local vendor - it’s a spiced chai that’s very popular in Qatar, and we drank it numerous times a day! There is no end to luxury hotel accommodations in Qatar - and they’re surprisingly affordable! We stayed at the elegant Shangri-La Doha, located right in the heart of downtown Doha. It averages at a little over $200/night, which is a steal for a five-star property. We loved how they greeted us with coffee and dates upon arrival, and the luxe breakfast buffet was a welcomed treat when we were up early due to jet lag! 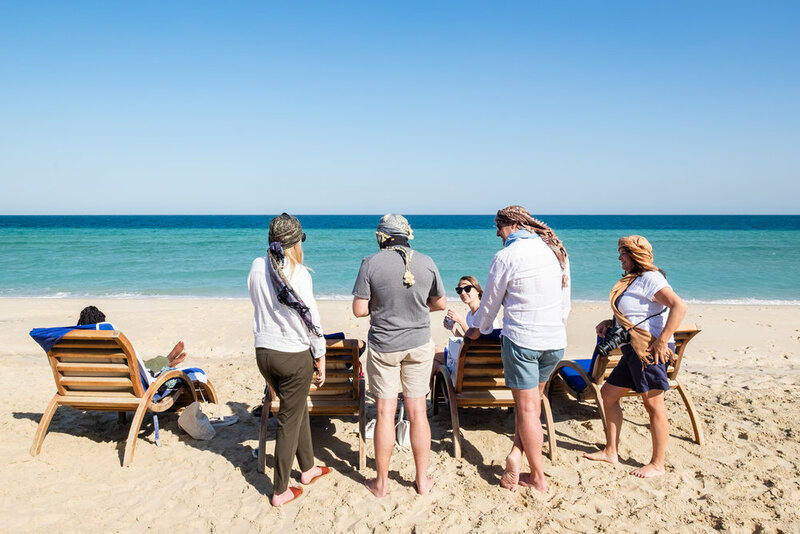 Next time we go to Qatar, we want to stay at the Banana Island Resort Doha by Anantara, located on an island just a short boat ride away from Doha. Stunning rooms, private beaches, luxe pools, dining, and more… is it too early to book our next trip back? Tons of space at the Shangri-La. And insane views! If the weather is nice, there’s no better spot in the city for waterfront dining than Al Mourjan. 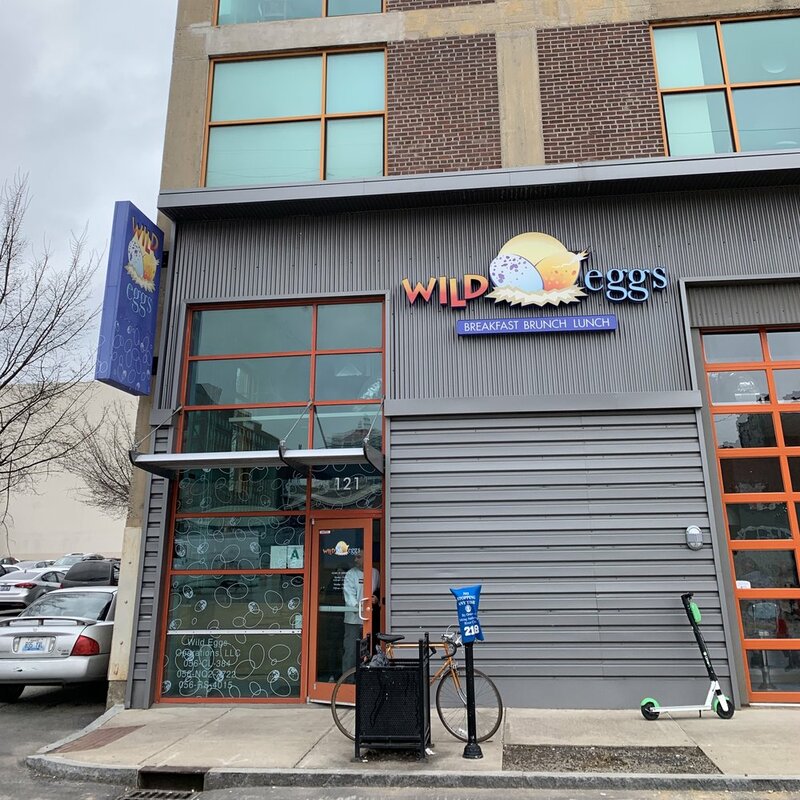 Grab a seat at their outdoor patio, order a round of refreshing “Lemon Mint” drinks (a local favorite), and enjoy their fresh and hearty Lebanese food. Take your time and enjoy the views… It’s heavenly! Our crew for the week! One of the most well-known and celebrated restaurants in Doha is Spice Market, a South East Asian restaurant located in the W Hotel and Residences. 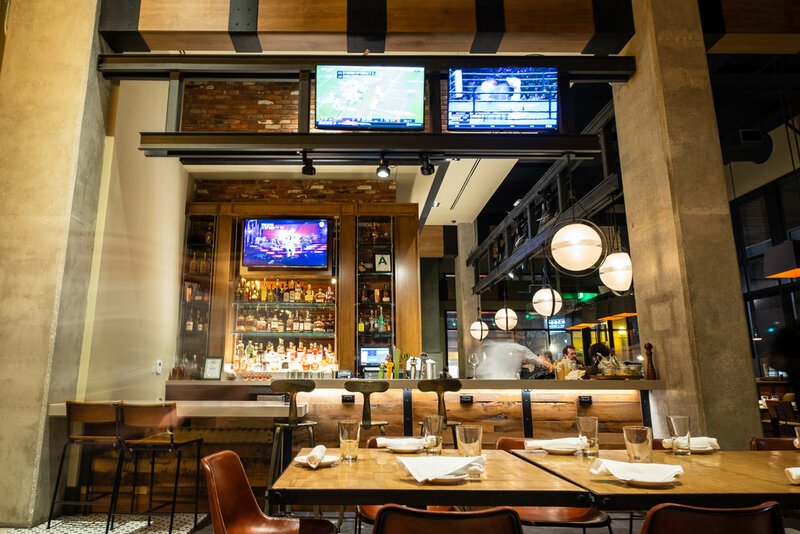 The ambiance alone is reason to come here, with its vibrant lights and cozy booths. However, the real star of the show here is the food - it’s flavorful, creative, and served family style. Don’t leave without trying the Cinnamon Ice Cream for dessert! From the moment you walk into Ard Canaan, it feels as though you’ve stepped into a different world. You get a strong sense of Palestinian culture by the food, spices, and interior design - even the bathrooms here are beautiful! Try the Ard Canaan Kibbeh and the Eggplant Fattah, and their fresh juices are delicious too! This was our first time having Palestinian food - and we absolutely loved it! You’ll feel like royalty dining in this opulent Iranian restaurant in the heart of the Souq Waqif! From the moment you walk through the sparkling entryway, Parisa will dazzle you with its glimmering decor and friendly service. 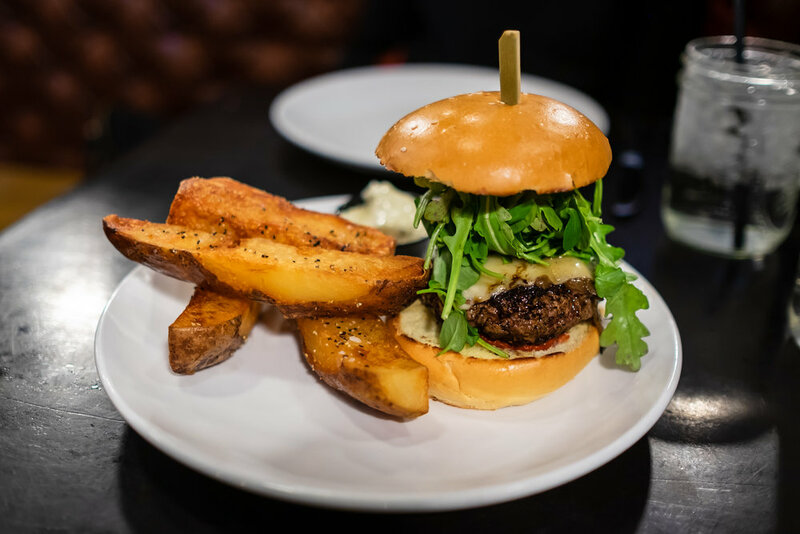 The menu is as delicious as it is extensive, and the portions are extremely hearty. Come hungry - and don’t forget your camera! You can’t visit Qatar without seeing the Arabian desert. Book a Half Day Desert Safari that will undoubtedly leave you in awe. You’ll fly through the dunes, see the ‘Inland Sea’ and the Saudi Arabia border, ride camels, and score dozens (if not hundreds) of epic photos. 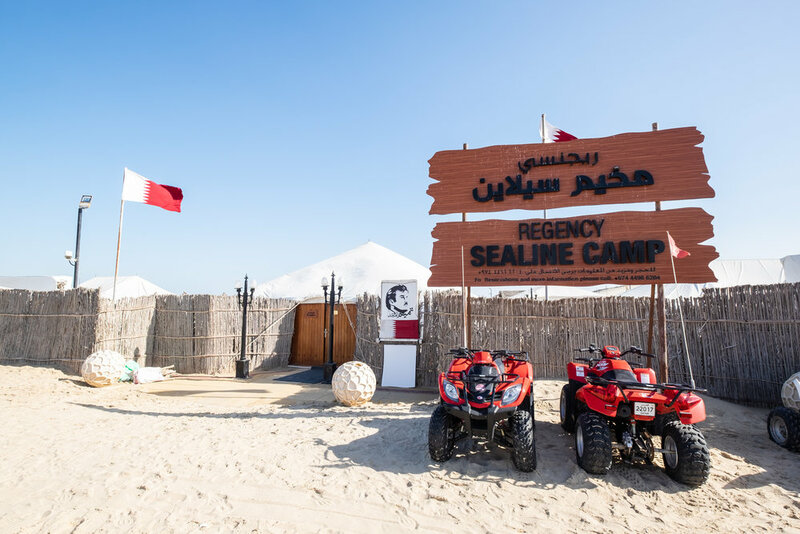 And if you have time during your desert excursion, stop at the Regency Sealine Camp for a dip in the Persian Gulf, and an extravagant Arabian lunch! Taking a break from flying around the dunes! The Arabian Sea is really salty and it’s SO easy to float! The best! Sure, this may not be the most “conventional” attraction in Doha, but it’s an awesome way to see the city! Blue Pearl Experience offers 90-minute kayak rides around The Pearl, a man-made island off the West Bay Coast. The Pearl is one of the “Most Glamorous Addresses” in the Middle East, and features stylish yacht-lined marinas, luxury shopping, fancy residential towers, and more. 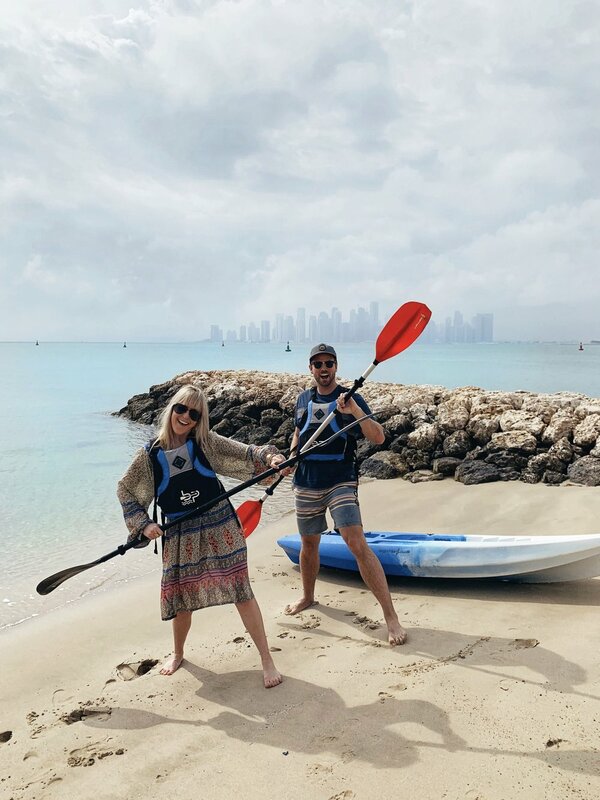 You’ll see it all by kayak - and even catch a stunning glimpse of the Doha skyline. Located in the MIA Park (which is worth walking around as well) on it’s own purpose-built island, The Museum of Islamic Art is an architectural masterpiece. The exterior alone is breathtaking, and its structure beautifully mimics the Nicab worn by Muslim women. Inside you’ll find the largest collection of Islamic art in the world, a cafe, gift shop, and one of the best fine dining restaurants in Qatar, IDAM. 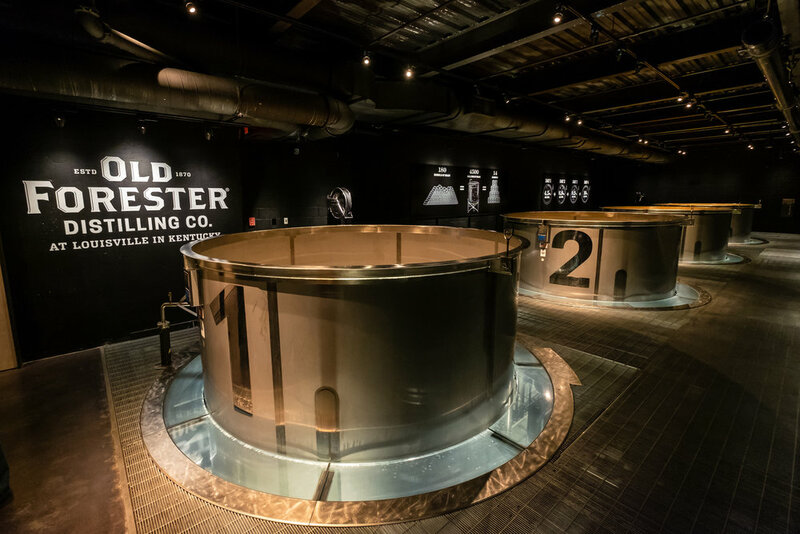 Give yourself at least a solid hour or two to explore the museum, as there’s a lot to see! A Jeweled Falcon created with Gold, rubies, emeralds, diamonds, sapphires, and onyx. Insane! 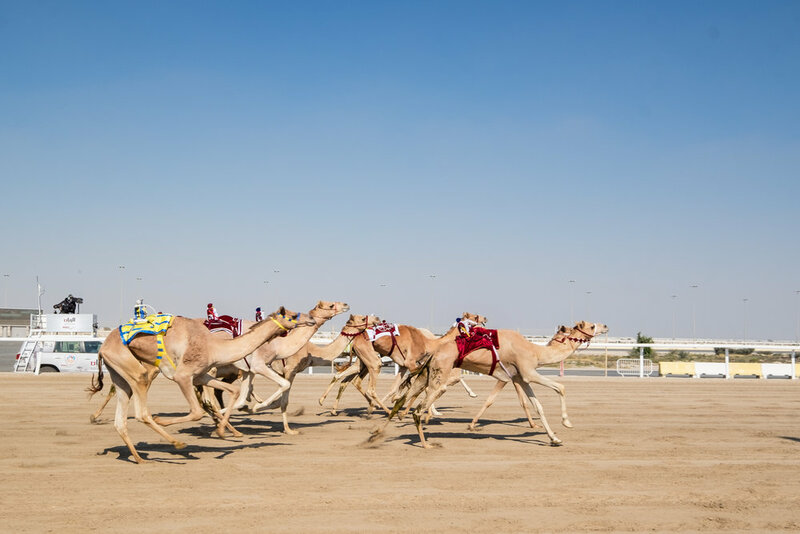 Camel racing has been a part of the Qatari lifestyle and tradition for centuries, and since the early since the early 1970’s it’s become a competitive sport and a multi-million dollar business. Robot jockeys are strapped to the camels backs, and are controlled by their owners (driving in their cars along the track). It’s kind of hard to explain, but it’s CRAZY fun to watch!! The Al Shahaniya Camel Racing Track is an hour drive from Doha, so we suggest having a local tour guide take you there. The races are free, and run from October-February. The sunsets in Doha are beautiful, and there’s no better spot to catch them than on a “dhow”, a traditional Qatari sailing boat. Head to the Corniche, Doha’s waterfront promenade where you’ll find an array of dhows to choose from. Simply approach its captain and barter a fee - if you’re lucky, you just might have the boat all for yourself! 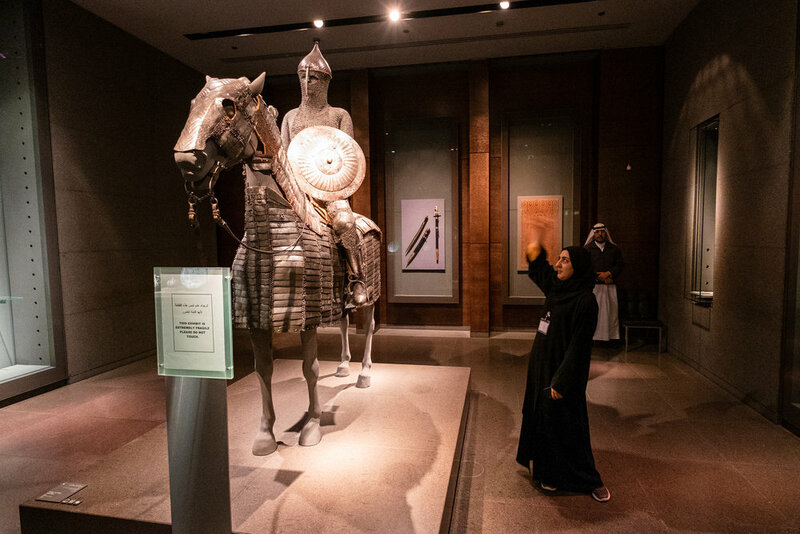 Depending on how much time you have, other places that are worth a visit are Katara Cultural Village, the National Museum of Qatar, and Mathaf: Arab Museum of Modern Art. And if we’ve missed any must-see spots, feel free to leave a comment and let us know! Can’t get over these views! It’s February. It’s the time of year where many-a-people run from the cold and flock to somewhere warm. It’s the high season for tropical, beach-y destinations like Hawaii, Turks and Caicos, and Cabo. Call us crazy (maybe it’s our rebellious side coming out), but we highly suggest doing the opposite. Sure, mai tai’s on the beach sound great - but let’s be real. 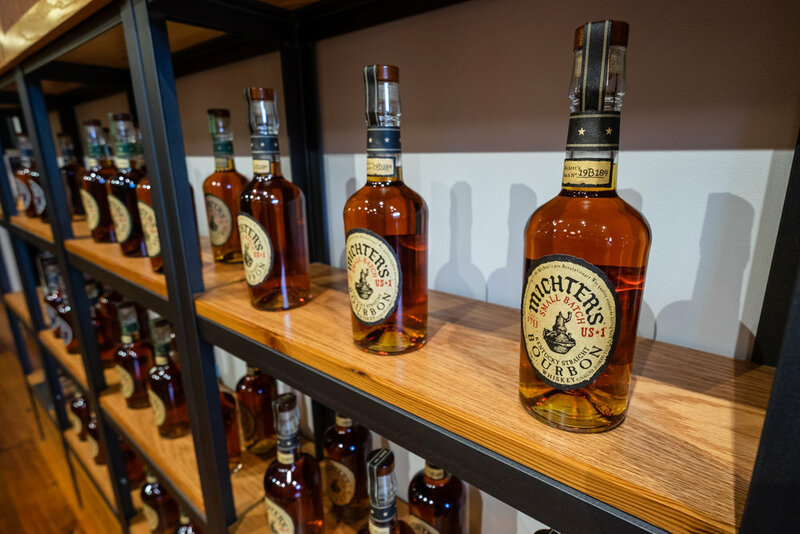 You’ll be fighting the crowds, and you’ll be paying a high premium to do so. We think tropical getaways are always better during the off-season, where prices are practically slashed in half, and your chances of having the beach all to yourself are significantly greater! 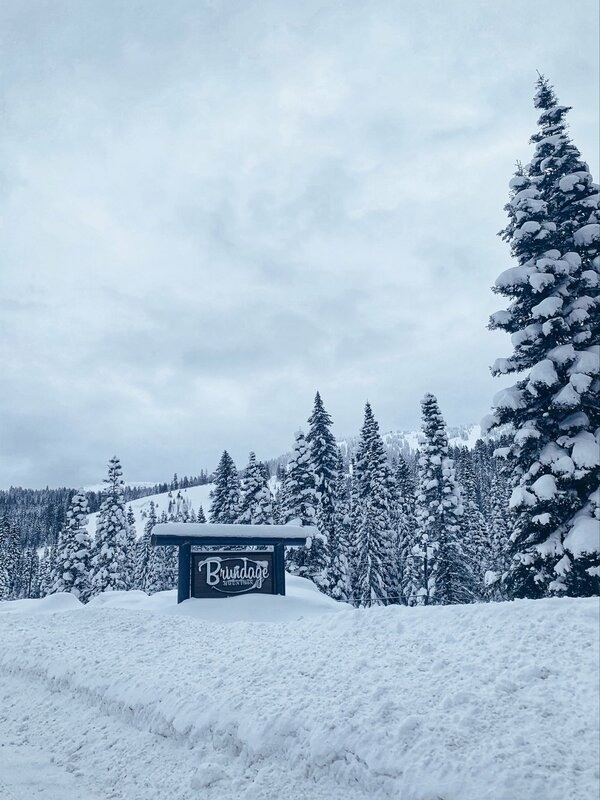 So this winter, we decided to head somewhere different. Somewhere snowy. 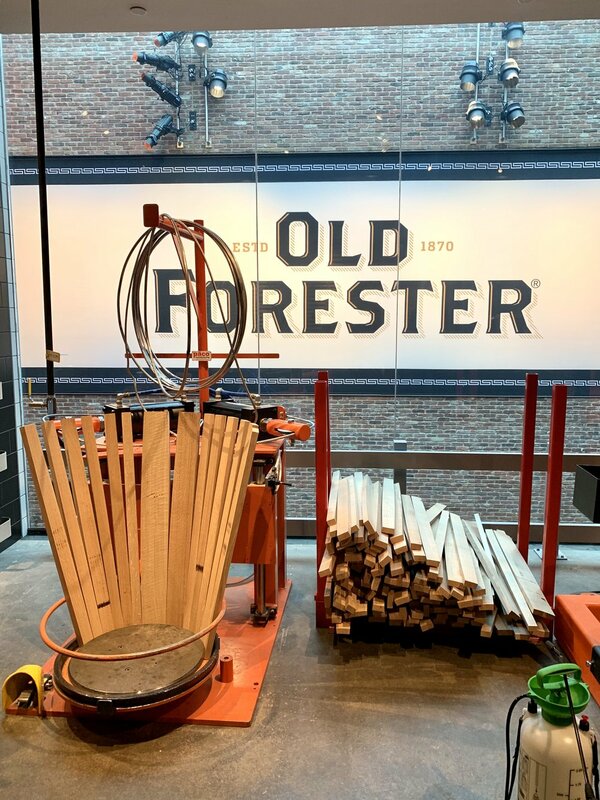 Somewhere that’s up-and-coming, full of winter activities (both indoor and outdoor), culinary experiences, and that friendly, Midwest charm. 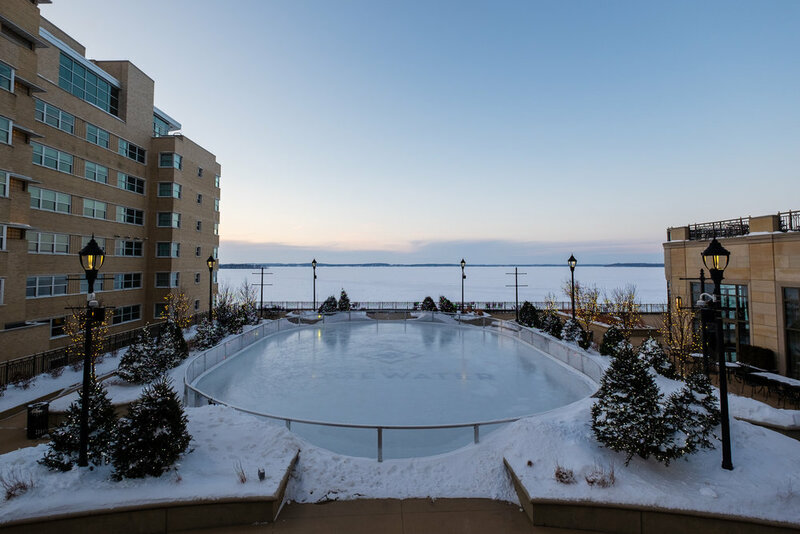 We got two round-trip tickets to Madison, Wisconsin, packed our winter coats (and hand warmers), and prepared for some sub-freezing exploring.! Here’s what we did, and what YOU should do when you head that way! Great photo opps in front of the Capitol building! 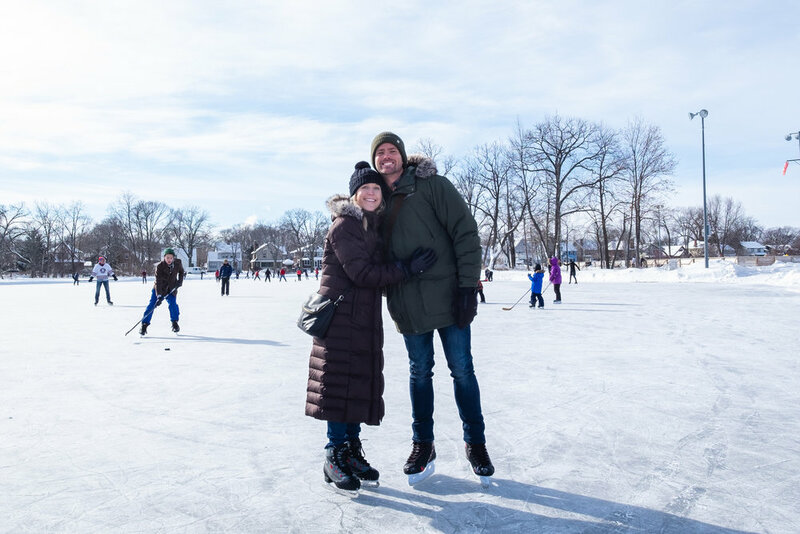 Have you ever ice skated on a frozen lagoon before? We hadn’t either! 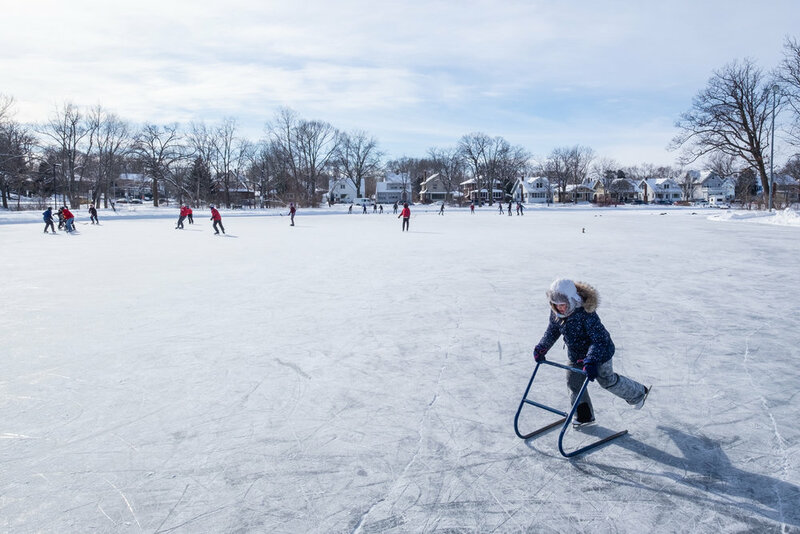 Tenney Park is something out of a storybook - with snow covered trees, picturesque bridges, and dozens of families skating across the lake. 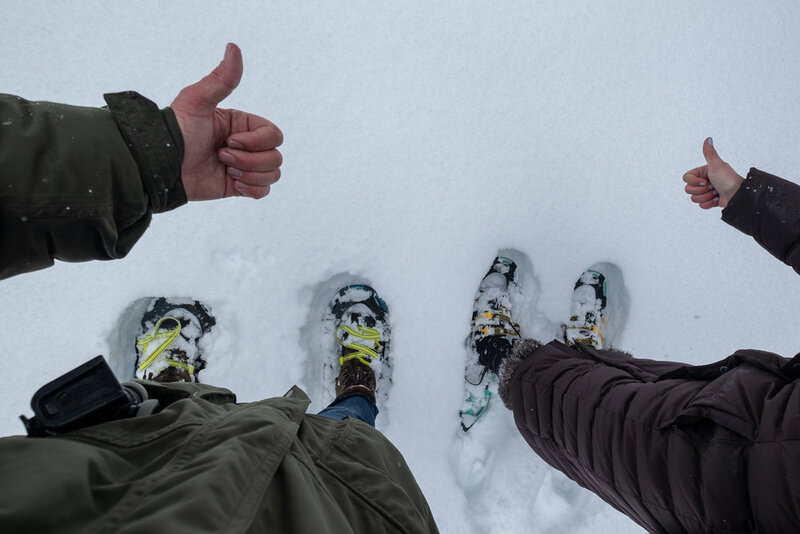 You can rent ice skates for only $6/hour, and you can warm up with a hot cup of cocoa at the warming center after you’re done. If you’re a seasoned skater or hockey player, bring your stick and slide into one of the pickup hockey games. 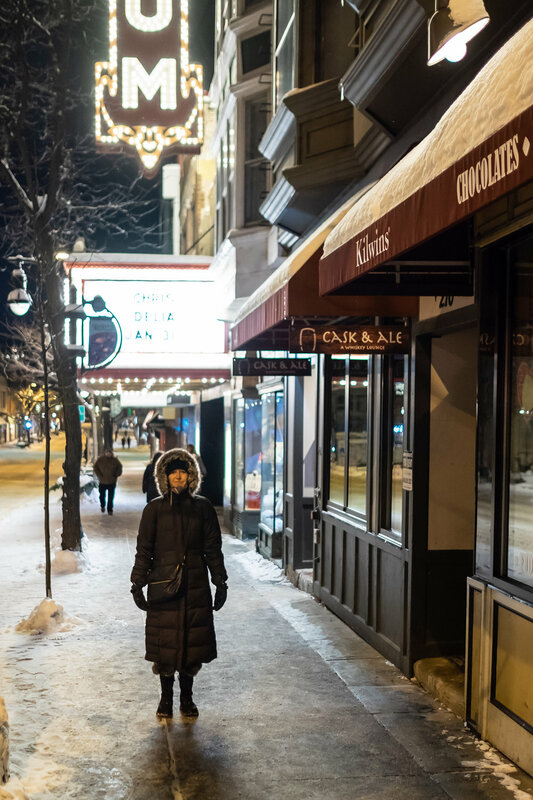 One of the most iconic streets in Madison is State Street, that runs from The Capitol Square to the University of Wisconsin-Madison campus. 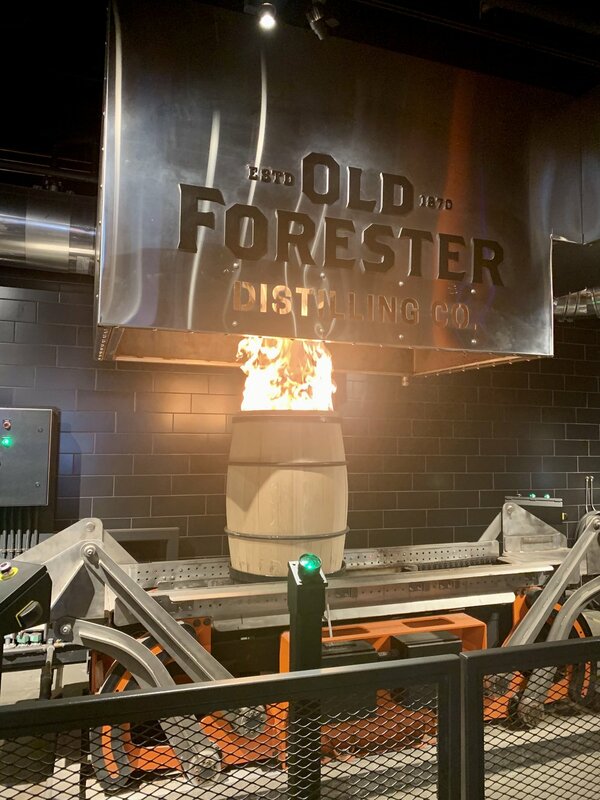 State Street has everything from fine dining to quirky boutiques, the Madison Museum of Contemporary Art, lively bars, and more. We found ourselves on State Street every day that we were in Madison - there was simply too much to see! 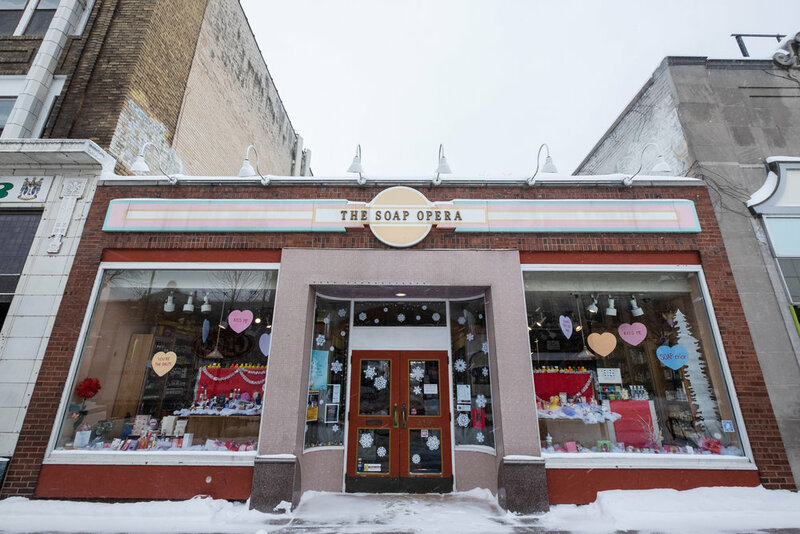 Some of our favorite spots were Cask & Ale, Paul’s Book Store, August, The Soap Opera and Little Luxuries. There’s no doubt that the craft beer scene is thriving in Madison. It’s “microbrew country”, as they like to say, with several fantastic tasting rooms and award-winning breweries. And we can’t think of a better way to spend a snowy day, then “hop-ping” (Get it?) around a few! 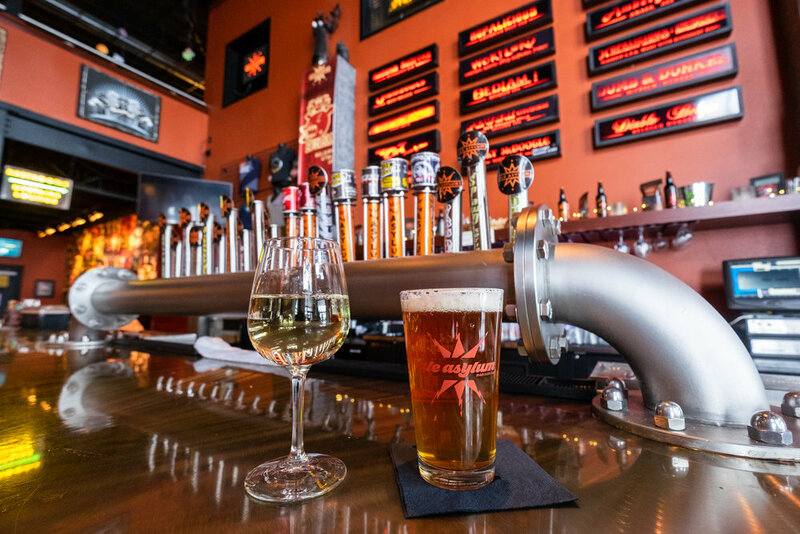 There are breweries for any kind of beer fanatic - we took a liking to Ale Asylum, Karben 4, and ALT Brew. 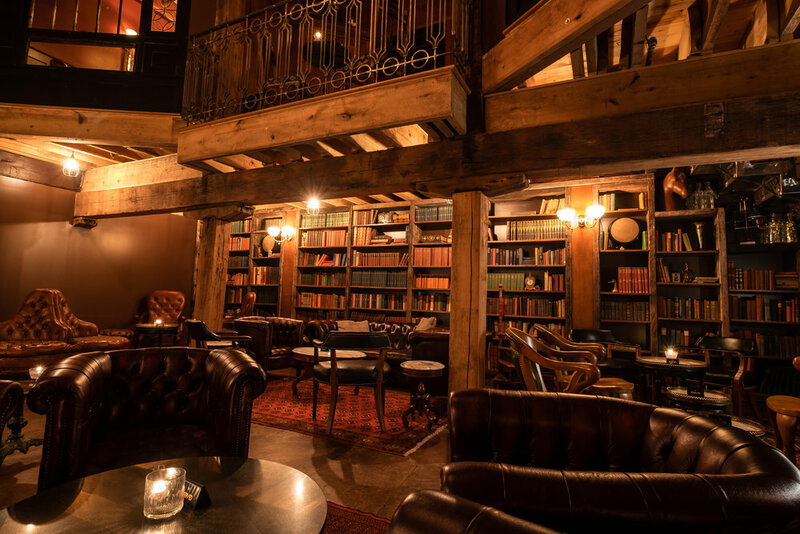 Find yourself needing a warm escape from the cold air? Well, we’re happy to say that a tropical oasis DOES exist in the middle of the snow! 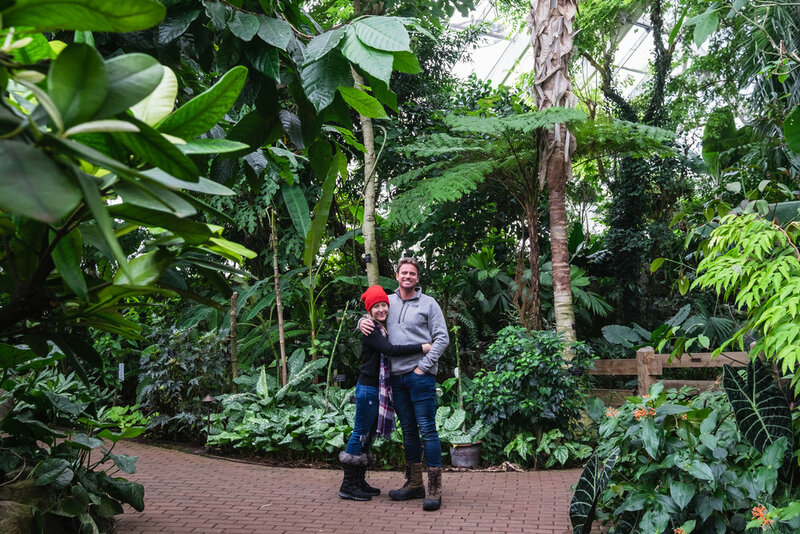 While the Olbrich Botanical Gardens has over 16 acres of outdoor gardens, they also are home to the Bolz Conservatory - a warm and sunny escape from the oftentimes below freezing temperatures outside. There’s tropical plants, pretty birds, lakes with koi, and temperature in the conservatory is always kept between 65-95 degrees! And with admission at only $2/person, it’s an easy and affordable way to spend an afternoon! And don’t forget to brave the cold and walk around some of their gorgeous outdoor gardens… you’ll feel as though you’ve entered a different land! 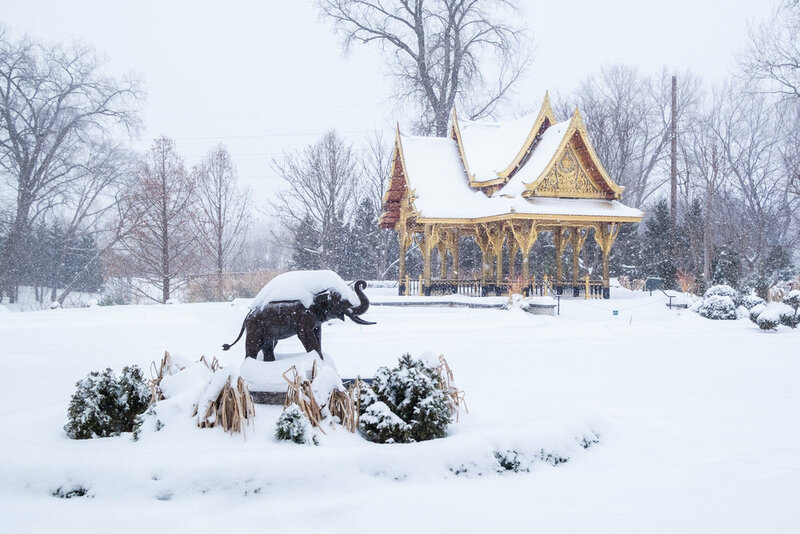 Thai temples in Wisconsin? You bet! We’ll take any excuse to have a spa day - and wintery weather is the perfect excuse! The Edgewater Madison is home to a luxurious, waterfront spa that’s cozy and welcoming and offers every kind of treatment one could want. If you’re heading there with your significant other, we highly recommend their signature Couples Massage. Complete your spa day with a glass of champagne, and a dip in the relaxation pool! Does it get anymore romantic than that? 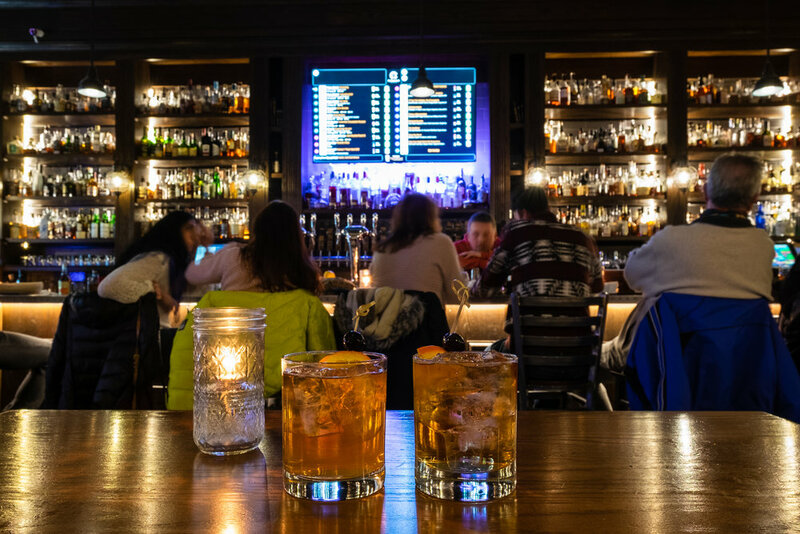 If we’ve convinced you to head to Madison, you’re in luck. February 8-18 is Madison Hotel Week, where you can find discounted room rates at some of the best hotels in the city! 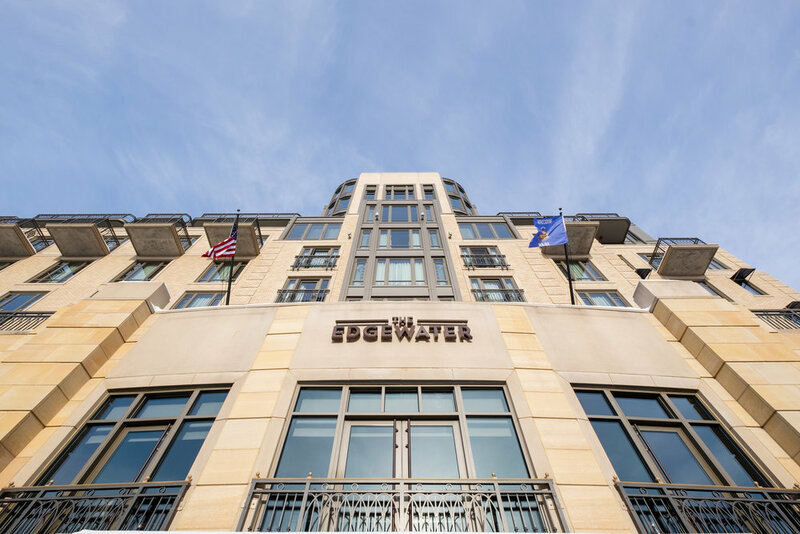 We stayed at The Edgewater Madison, and absolutely loved it. 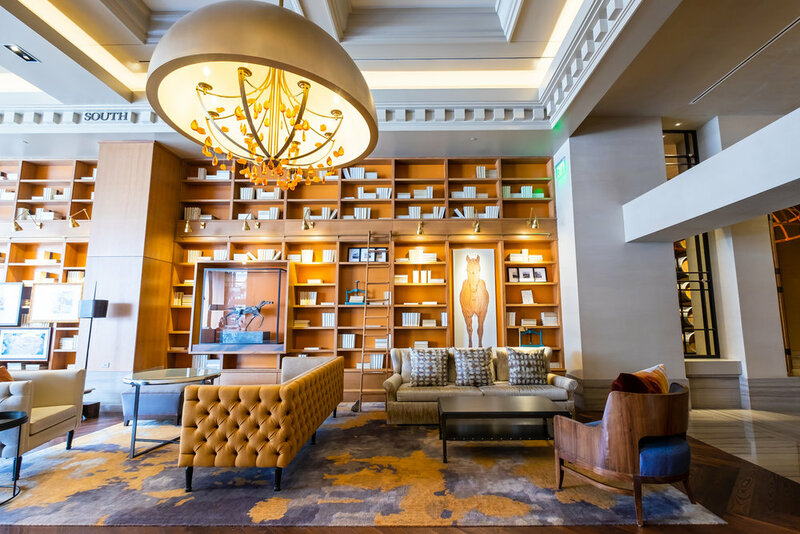 They’re offering a discounted rate of $125/night during Madison Hotel Week, which we think is a lovely time for a Valentine’s Day Getaway. Views from our balcony. Can you see the “I Love U"? The staircase inside the Edgewater is beautiful! Madison, Wisconsin blew us away. 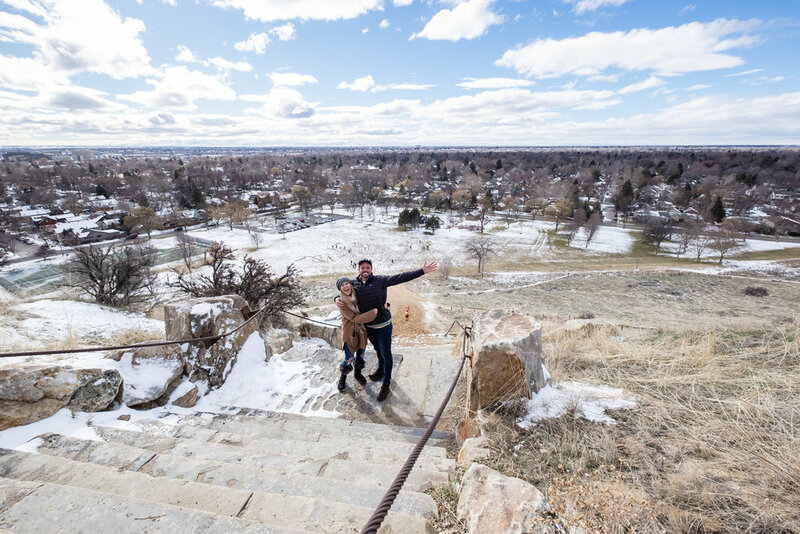 The friendly locals, the lively downtown, the stunning, snowy scenery… We loved every minute of it. And we can’t wait to return.